My involvement with the Basil Sellers Art Prize—a biannual $100,000 award for contemporary art on the theme of sport—means that I’m often asked to comment on the supposed conflict between athletes and aesthetes. I usually begin by pointing out that this wasn’t always so. In this article I tried to identify the historical moment at which Australian artists’ interest in sport gave way to opposition. Reflecting on his beginnings as a playwright in the early 1970s, David Williamson aired a familiar lament; ‘it was believed that anyone with talent in writing, theatre or film should leave the country immediately and work elsewhere before they were stifled by the deadly distrust of creativity in sports-obsessed Australia’.1 So there it is, sport is the enemy of art. This from a man whose play, The club (1977), captured the behind-the-scenes drama of an Australian rules football club, who was the number-one ticket holder for the Carlton Football Club, who cameoed as a football-playing ANZAC in Peter Weir’s Gallipoli (1981). Why does a creative Australian who clearly loves football feel besieged by his own peers, sports fans? This from a man who hung John Brack’s Three of the players (1953), an elegant frieze of Collingwood footballers, in the dining room of the home he built for himself in South Yarra. Was it there to remind him, in his own modest temple to the modernist aesthetic, that this was the ‘Digger cult’—as he termed it in his book The Australian ugliness (1960)—that he must overcome? Or did he perhaps feel that Brack, in reducing the footballers to generic templates of 1950s masculinity, was successfully skewering their ‘moronity’? Such are the contradictions that arise when cultural commentators adopt the classic tactic of modernist criticality; seeking to be in but not of their culture, attempting to speak of its realities at close quarters even as they seek to redefine that reality. More plainly, this is what happens when the rise of art rests on the destruction of a straw man. 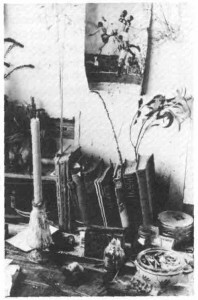 That capacity to position sport purposefully—but not uncritically—within art continued well into the twentieth century. Artists as diverse as Grace Cossington-Smith, Margaret Preston, Albert Tucker and Russell Drysdale all found a place for sport, whether as part of the everyday scene or as a larger symbol (occasionally an ambivalent one) of national character and aspiration. 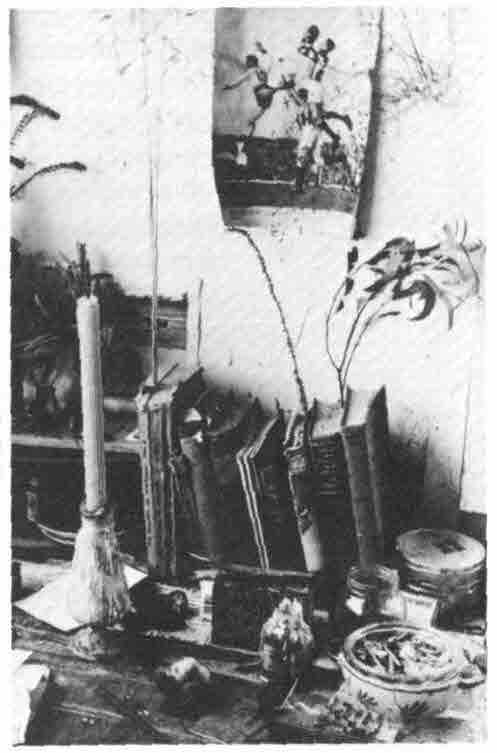 A corner of Sidney Nolan’s studio, c. 1947. Photographer unknown. So, for some one hundred years, sport was seen as a dynamic, if occasionally problematic, register of the Australian spirit. Only in the 1960s did the chasm between sport and art open. What happened? Why did sport cease to be the exemplification of national vigour—of a ‘youthful race, buoyant and strong, bounding into a manhood that must command the admiration of the world’7—and come to represent ‘moronity’ instead? Was this a reaction to a particular event; perhaps to the provincial pageantry of the 1956 Melbourne Olympics? Or to a particular personality; with a cricket-loving Prime Minister [Sir Robert Menzies] allowing the conflation of love of sport with conservative politics? To my mind, the answer lies in the cultural pessimism that characterised the liberal cultural commentary of the 1960s. Boyd, Donald Horne, Ronald Conway and others surveyed the nation’s character in popular texts with consistently negative or ironic titles—The Australian ugliness, The lucky country, The land of the long weekend—and found it wanting. Colonial and modernist confidence in Australian identity gave way to a terrifying vacuum. ‘There can be few other nations’, Boyd wrote, ‘which are less certain than Australia as to what they are and where they are’.8 Sport was no longer aspirational and affirmative. On the contrary, it was a kind of false consciousness, masking Australia’s lack of self-reflection with the glitter of trophies. As these advocates for a critical appraisal of Australian culture struggled to press their case in Godzone country, their resentment of sport became raw and direct. ‘Sport’, Donald Horne noted bitterly, ‘has been one national institution that has had no “knockers”. . . To play sport, or watch others play, and to read and talk about it is to uphold the nation and build its character’.9 So, from behind ramparts, the cultivated Australian sees sport suffering none of the attacks that it does and, worse, usurping art’s role as the definer of national character. This cultural pessimism has cast a long shadow. New life is pumped into it with every comparison, invariably unfavourable, of government spending on sport and the arts or with every headline grabbing case of an athlete behaving badly. We will continue to see art and sport in opposition while cultural pessimism—a deep anxiety about the shallowness or hollowness of Australian character—propels the debate. If one of our greatest grumpy old men can soften, and find a common place for fans of literature and sport alike, there’s hope for us yet. Original publication: ‘Fair game: art versus sport in “the lucky country”’, Art and Australia, vol 47, no 4, June 2010, pp 582–85.